To Cite: Hosseini B, Mirhadi S M, Mehrazin M, Yazdanian M, Kalantar Motamedi M R. Synthesis of Nanocrystalline Hydroxyapatite Using Eggshell and Trimethyl Phosphate, Trauma Mon. 2017 ; 22(5):e36139. doi: 10.5812/traumamon.36139. Background: Recently, the use of synthetic bone graft substitutes has garnered attention and become more popular than traditional methods for reconstructing osseous defects in the fields of orthopedics and maxillofacial surgery. Commercially available hydroxyapatites (HAs) have been widely reported to be effective bone graft substitutes. Unfortunately, they are expensive to produce. Thus, there is a need to develop methods of producing HA bone graft substitutes from inexpensive sources. Objectives: To synthesize nanocrystalline HA using recycled eggshell and trimethyl phosphate. Until date, several phosphate solutions have been utilized for this purpose. However, this is for the first time to the best of our knowledge that trimethyl phosphate is used as a source of phosphate to synthesize eggshell-derived HA. Methods: To produce HA, calcined hen’s eggshell was used as a source of calcium, and trimethyl phosphate was used as a source of phosphate in a sol-gel method at a controlled temperature. The results were estimated using scanning electron microscopy (SEM) observantion to evaluate surface morphology, X-ray diffraction (XRD) to analyze phase composition, and transmission electron microscopy (TEM) to evaluate the shape and size of prepared HA. Micro-chemical analysis was conducted using energy-dispersive X-ray spectroscopy (EDX). Fourier transform infrared spectroscopy (FTIR) was employed to identify the functional groups of the prepared HA. Results: XRD evaluation showed that high-purity synthetic HA powder was obtained. The results of the SEM, XRD, TEM, EDX, and FTIR analyses demonstrated that the synthesis yielded nanostructured HA. Conclusions: A complete synthesis of nanocrystalline HA was obtained by using trimethyl phosphate and eggshells in a sol-gel method at a controlled temperature. A spherical particle morphology and particle size ranged 19 - 41 nm were achieved. Eggshell waste material is inexpensive and can be considered a viable choice for high-volume HA powder production, based on the present results. Autografted tissue is the preferred material for reconstructing osseous defects in the fields of orthopedics and maxillofacial surgery (1). However, the use of bone harvesting to obtain graft tissue contains some complications. It requires additional surgery with associated risks, and the quantity of harvested bone is limited (2-4). Allografting is also an option, but it carries a risk of viral transmission (5, 6). Recently, the use of processed or synthetic bone graft substitutes has garnered attention and become more popular than traditional methods (7, 8). Hydroxyapatite (HA), with the formula Ca10(PO4)6(OH)2, is a calcium phosphate bioceramic with a chemical composition almost identical to mineral components in natural bone. HA is a biocompatible, bioactive, and osteoconductive material (9-11) and is therefore widely used as a biomaterial in fields of medicine, dentistry, and pharmacology. It has been used as bone graft substitute for over 30 years (12, 13). HA has also been used as a coating for dental implants (14). Commercially available HA has been widely reported to be an effective bone graft substitute in oral and maxillofacial applications (15, 16). Unfortunately, commercially available, high-quality HAs are expensive to produce due to the need for high-purity reagents. Therefore, there is a need to develop methods of producing HA bone graft substitutes from inexpensive sources. Previously, HA bone graft substitutes have been derived from several sources, such as bovine bones (17, 18), fish bones (19), and corals (20). These substitutes have the advantage of containing some properties of their raw materials, such as the pore structure and the presence of carbonated HA. However, some problems can arise due to the variability of physical and chemical properties of the raw material (21). One of the most inexpensive, widely available natural materials that can be converted into HA is an eggshell. Eggshell comprises approximately 11% of the total weight of an egg and is composed of calcium carbonate (CaCO3; 94%), calcium phosphate (1%), organic matter (4%), and magnesium carbonate (1%). The idea of using eggshell as a bone graft substitute was first proposed by Dupoirieux et al. in 1995 (22). The researchers in that pilot study did not produce eggshell-derived HA but used only avian hen’s eggshell as material for a bone graft substitute. The powder produced in that study contained 95% calcium carbonate. Although the material was biocompatible, it was not osteoconductive, and graft healing was only achieved by fibrous union. Another likely problem with using eggshell in grafts is the risk of transmitting Salmonella enteridis (23). In contrast to the aforementioned inherent problems of the powdered eggshell, eggshell-derived HA has been recently reported to be an appropriate bone graft substitute due to its capacity for osteoconductivity (13, 24, 25). The material properties and bone formation capabilities of eggshell-derived HA have also been reported to be superior to those of the commercially available bone graft materials (25, 26). In a recent study, eggshell-derived HA powder was used in the reconstruction of human maxillary cyst bone defects, and no complications occurred during the processes of wound healing or new bone formation (13). The risk of virus transmission from eggshell can be mitigated during the conversion to HA through the use of high temperatures (27). Eggshell-derived calcium carbonate in the calcite form can be converted into HA by hydrothermal reaction using a phosphate solution source (28). Several phosphate solutions have been utilized for this purpose, such as calcium phosphate, phosphoric acid, diammonium hydrogen phosphate, and dipotassium phosphate (24, 26, 29, 30). As the physical properties and phase purity of HA are process-dependent (31, 32) as well as particle size dependent, every method has its own merits and demerits. However, most of these methods are somewhat complicated and require high temperature processing. In the present study, we aimed to synthesize nanocrystalline HA from eggshell waste using a phosphate-containing source, liquid trimethyl phosphate. This compound is the trimethyl ester of phosphoric acid, a colorless and nonvolatile liquid that has some specialized usages in the production of other compounds (33). To produce HA in the present study, calcined hen’s eggshell was used as a source of calcium, and trimethyl phosphate 97% (Sigma-Aldrich, St. Louis, MO, USA) was used as a source of phosphate. The hen’s eggshells were first collected and cleaned thoroughly. Afterward, they were calcined in air at 900°C for 1 hour. During this procedure, the organic matter was decomposed, and the calcium carbonate converted into calcium oxide (CaO) by freeing carbon dioxide. The X-ray diffraction (XRD) patterns of the sample were recorded using a Bruker D8 Advance diffractometer with Cu Kα radiation, λ = 1.5015. Measurements of the XRD line widths were also used to estimate the mean particle sizes of the products by the equation: τ = Kλ/(βCosθ) (34), where τ is the mean size of the ordered (crystalline) domains, K is a dimensionless shape factor, λ is the X-ray wave length, β is the line broadening at half the maximum intensity (FWHM) and θ is the Bragg angle. The surface areas of the carbons were measured using a Micromeritics Flowsorb 2300 apparatus. The obtained experimental patterns were compared with standard patterns compiled by the joint committee on powder diffraction and standards (JCDPS), using Card No. 09-432 for HA. Scanning electron microscopy (SEM) was carried out on powdered samples coated with a gold film using a LEO 435VP SEM operated at 18 kV. The Ca/P ratio and micro-chemical analysis of the HA sample were determined by energy-dispersive X-ray spectroscopy (EDX) microanalysis (FEI Quanta 200 ESEM equipped with an EDX EDS device). Transmission electron microscopy (TEM) (Philips CM120: Eindhoven, The Netherlands) was utilized to evaluate the shape and size of the prepared HA. The samples were dispersed in ethanol (≥ 99.9% purity; Merck Millipore, Darmstadt, Germany) and ultrasonicated for 30 minutes. Afterwards, they were picked up with carbon-coated copper grid (200 mesh) for TEM characterization. In addition, Fourier transform infrared spectroscopy (FTIR) was employed to identify the functional groups of the prepared HA. The raw eggshell showed patterns consistent with CaCO3, and CaO was detected in the calcined eggshell. The peaks in the XRD pattern of the calcined eggshell powder indicated that the CaCO3 was completely decomposed and converted to CaO at about 900°C (Figure 1). During the extrusion of organic matter, the resultant powder changed its color from white to gray, and consequently back to white. Therefore, the snow white powder obtained from eggshells is nothing but CaO (29). 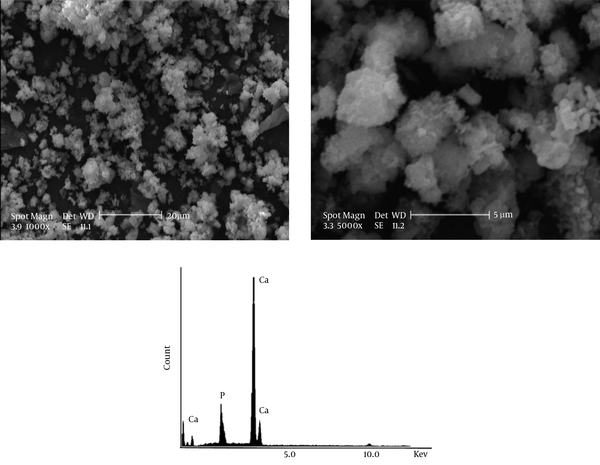 Thermal processing of CaO in the phosphate solution produced a nanocrystalline powder with a white color, high mechanical strength, and with irregular diameters. Figure 2 shows the XRD pattern of synthesized HA powder at 950°C. As shown, a complete synthesis of HA was implemented according to the stoichiometric ratio of Ca/P = 1.67. The SEM micrographs and EDX spectrum of the HA nano-powder are shown in Figure 3. From the SEM images, it can be seen that the precipitated crystallites of the HA were of a spherulite morphology with a narrow size distribution a few microns in diameter. The spherical morphology can be attributed to the low pH (~5.2). Furthermore, the EDX analysis demonstrated the micro-chemical composition of the HA sample. Previous studies have demonstrated the effect of pH on the crystallization and morphology of calcium phosphate powder (24). The spherical morphology of the particles obtained in our study resembles the study of Sooksaen et al. (35) and Siva Rama Krishna et al. (26). Park et al. carried out different phosphate-containing solutions and consequently, different surface morphologies of HA were obtained, such as platelet-like, needle-like, or rod-like microstructure (25). Therefore, the surface morphology of the eggshell-derived HA can be modified by optimizing the composition of the phosphate solution (30). In the present study, the spherulite was composed of nano-sized particles. To characterize the morphology of the spheres, TEM analysis was performed on ultrasonically dispersed HA in ethanol. The bright field TEM image of oven-dried HA powder is shown in Figure 4. This image reveals that the powders were formed by agglomerates of irregular particles of 19 to 41 nm. This was consistent with Scherrer equation of the XRD pattern of this sample, which indicated that the crystallite size was about 27 nm. This particle size is approximately similar to that of reported in some other studies. Krishna et al. 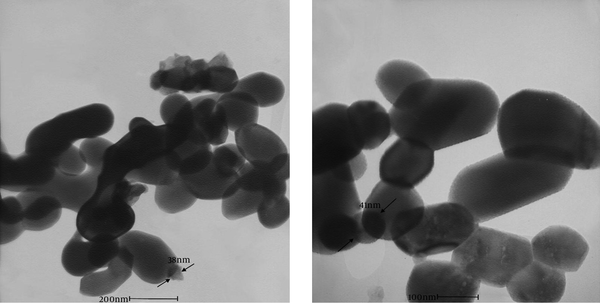 synthesized platelets particles 33 - 50 nm in length and 8 - 14 nm in width (26). They converted eggshell into nanocrystalline HA using diammonium hydrogen phosphate solution by microwave processing. Chaudhuri et al. carried out eggshell and dipotassium phosphate and achieved a circular particle morphology and particle size of about 41 nm (29). Natural bone minerals are nanostructured non-stoichiometric HA of dimensions 20 nm in diameter and 50 nm in length with substitution of ions such as magnesium, fluoride and carbonate. From bionics point of view, synthetic apatites to be used for reconstructing damaged hard tissues are expected to have characteristics closer to those of biological apatite in both composition and structure (36). Webster et al. demonstrated the enhanced bioactivity on nanometer-size surface topography of crystalline HA (37). Thus, the HA nanocrystals produced in the present study possess a compatible size with natural bone materials. Figure 5 shows the FTIR spectrum of the HA sample after hydrothermal treatment. Phosphate group formed absorption bands at 1042 - 1096 cm-1 and bending bands at 574 cm-1. Carbonate group formed a weak and wide peak at 1494 cm-1. An absorption with an explicit peak at 3644 cm-1 corresponding to the stretching vibration of the OH- ions are presented in the HA structure. The FTIR spectral behavior of the prepared HA sample also agreed with that of reported elsewhere (26, 29, 38). This assay and the XRD results confirmed the presence of the Ca10(PO4)6(OH)2 in the sample. It is estimated that more than 500,000 bone-grafting procedures are performed annually in the United States, with the rest of the world comprising another 500,000 per year (39). The estimated cost of these procedures in the United States is reported to be more than $1.5 billion per year (39). The use of autogeneous bone grafts is decreasing as bone graft substitutes become more commonly used (40). This shift might be attributed to the inherent problems of autografts discussed above (2-4). Therefore, the market for bone replacement materials is growing. An increasing number of bone graft alternatives have become commercially available for use in orthopedic and maxillofacial applications. These alternatives vary in their compositions and claimed mechanisms of action. However, commercially available bone substitute materials are expensive, particularly in low-income and developing countries, where they currently must be imported. Thus, having a ready method for producing bone graft substitutes from an inexpensive source could alleviate the present obstacles to the use of these substitutes. This study involved an approach to producing HA powder from eggshell waste, an inexpensive and unlimited material. In our country, estimated to be the sixth-largest producer of hen's eggs in Asia, annual egg production is estimated to be about 665,000 tons (41). As the eggshell comprises 11% of the total egg weight, approximately 73,000 tons of eggshell are available per year. Using eggshell as a natural, inexpensive, and surplus source of calcium carbonate should therefore be taken into account in the future. In our country, this is for the first time to the best of our knowledge that an egg-shell derived HA powder is prepared. In the near future, we aim to continue evaluating this material's usage in animal and human models, and to improve its microporous structure. Since the porosity of the prepared synthetic bone material was not evaluated in this study, the authors suggest for future studies to evaluate the amount, types, and size of porosity. In the present study, a simple method was utilized to prepare fine particles of HA from eggshell wastes and trimethyl phosphate solution. By using trimethyl phosphate as a phosphate source in a sol-gel method at a controlled temperature, a spherical particle morphology and particle size ranged 19–41 nm were achieved. The resulting powder consisted of high-purity ceramic calcium phosphate material. Eggshell waste material is inexpensive and can be considered a viable choice for high-volume HA powder production, based on the present results. Authors’ Contribution: All of the authors had an equal contribution. 39. Bone graft substitutes: facts, fictions &amp; applications.